Sunday morning was a sight to behold as swords danced to the formation of butterfly as both adults and children came in for the Butterfly Sword Training Camp at the headquarters of the Star Karate Club International at Iqbal-ud-Daula Devdi in the Old City. The dusty tracks of the once magnificent structure rose to the occasion amidst the elegant beauty of the swishing and swaying swords giving one a sense of exotic strength and nerves of steel to uphold. The delicate twists of the wrists for something that could be potentially lethal, was indeed a sight of outer-world beauty. Kids as young as five year-old strapped in belts blue, orange, maroon and black, including girls draped in scarves came in as early as 6.30 am to learn the art at the camp. On the side-lines of the camp, the Grand Master MS Jaweed spoke to The Hans India about the Club’s activities across the city, especially in the Old City. “Training girls in self-defence has always been important for the Star Karate Club,” says the Grand Master. 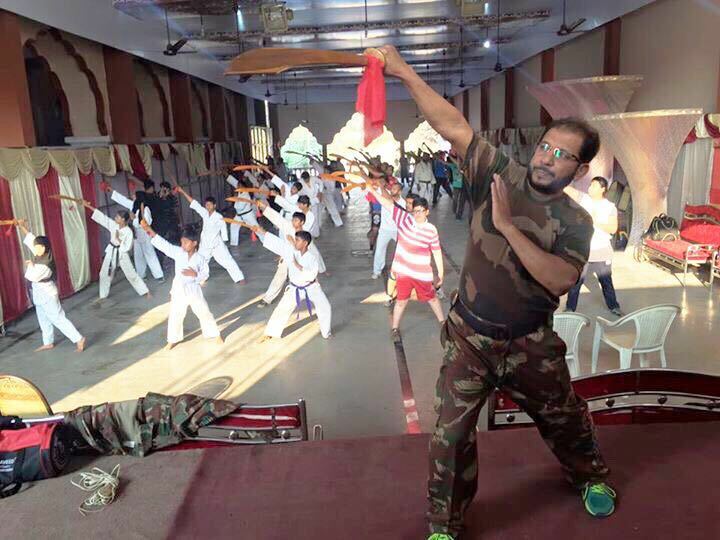 With over 47 years of experience in various forms of martial arts that include Karate, Judo, Jiu Jitsu in addition to Muay Thai and Kick-Boxing, Grand Master MS Jaweed is known for his contribution to sports at the national and international levels, as well as bringing Star Karate Club International to India. “Across the city, we train at upto 100 schools in Karate, Judo, Jiu Jitsu and muay thai,” he adds. A look across the student lines reveals as many as five black belts in the batch of 30 and these are just at one centre in the Old City. MS Jaweed, who is also the president of the Telangana Amateur Muay Thai Association (TAMTA) informed about the team’s spectacular performance at the ongoing National Federation Cup in Mumbai and which is promoted by actor Shah Rukh Khan along with his ‘Diwale’ co-star Varun Dhawan. Upto four team members from the lot of 250 fighters who came from 25 states for the championship, under the aegis of General Secretary MI Naveed, are currently in the final. This is only one of the many achievements of the Grand Master. Very recently, the Club’s Jiu Jitsu team, led by Coach MR Shahed, black belt 4th Dan, returned from a spectacular performance in Bangkok where one of the Club’s students bagged the fourth spot at the international level. 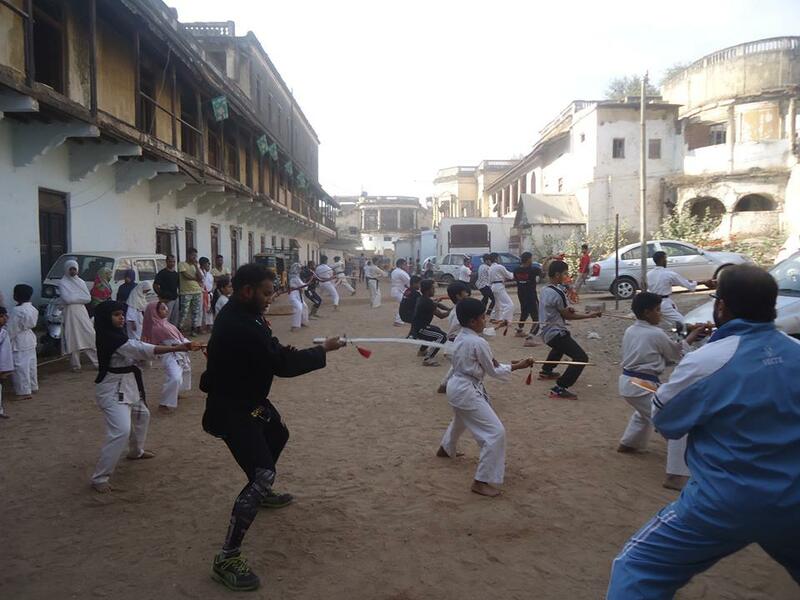 The club, as a special treat for its members, conducts the Butterfly Sword Training Camp. With upto 550 movements that involve the complete body, the agility of the special short-weapon sword is remarkable in providing stamina and flexibility to the body. The Club is hopeful to churn out members in the future who can represent the country at the Olympics with the ‘Katas’. As the camp concluded, certificates were given away to students that included the city’s youngest Karate trainee, five-year-old Md Amaanuddin, who is currently on orange belt! Having trained and honed decades of generations and giving their lives dedication and discipline, the messiah of martial arts, MS Jaweed is an image of humility and modesty in spite of all the greatness of his work. “I am just doing my duty to the society,” he smiles.